221 Aviation Company, and returned safely to the United States. The Moving Wall is a half-size replica of the Vietnam Veterans Memorial in Washington, D.C., and has been touring the country since 1984. The Wall displays 58,315 names of those who lost their lives in the Vietnam War. I have passed your thanks to John, very gracious, Becky. I concur, seeing evidence oneself does make more of a lasting impact than only hearing about it. Thank you for sharing and thank John for his service. 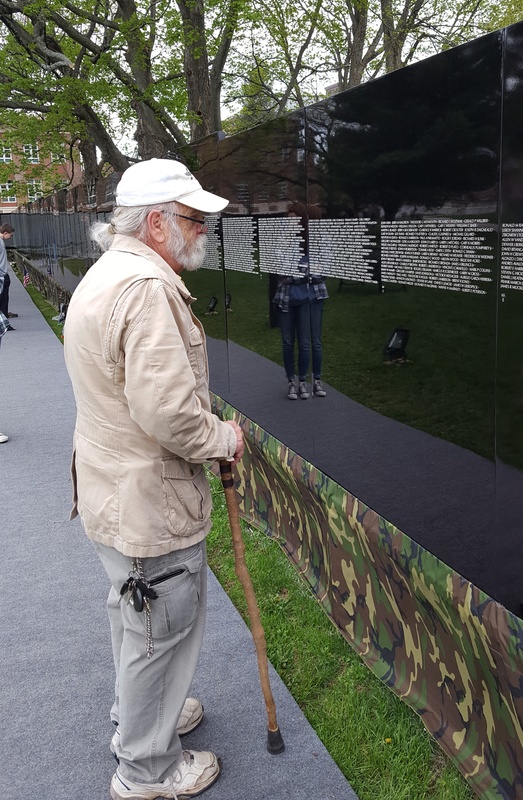 No doubt it’s very moving to view this Moving Wall or the real one in DC. Hope to be able to see one of them some day. Had forgotten how many troops were lost in Vietnam–it’s mind boggling! What beautiful words, Ginger, thank you. Returning much love to you! And then it came to me, how much more grieved is the heart of God over all who will not come home to Him. Only as we turn to Him can we make any lasting sense of it all….. I will have John read your comment, Marilyn, thank you. I think we have a classmate from WHS 58 on the wall, Kevin Duffy. Thank you, Wally, I will tell John. He has said he didn’t know what became of Kevin. THANKS TO JOHN FOR HIS SERVICE AND PTL FOR HIS SAFE RETURN FOLLOWING VIETNAM WAR. WAS PRIVILEGED TO SEE THE WALL IN D.C. YEARS AGO WITH GLEN (A VET ALSO) AND I CAN TELL YOU IT’S AN IMPRESSIVE AND SOBERING SIGHT AS I’M SURE THIS SMALLER VERSION IS AS WELL. TODAY IS A DAY FOR REFLECTION OOF THE HIGH COST OF FREEDOM AND OF DEEP GRATITUDE FOR ALL THOSE WHO SERVED AND SACRIFICED SO WE CAN ENJOY THAT FREEDOM. Thank you, Sandy. We have a great heritage of courage.